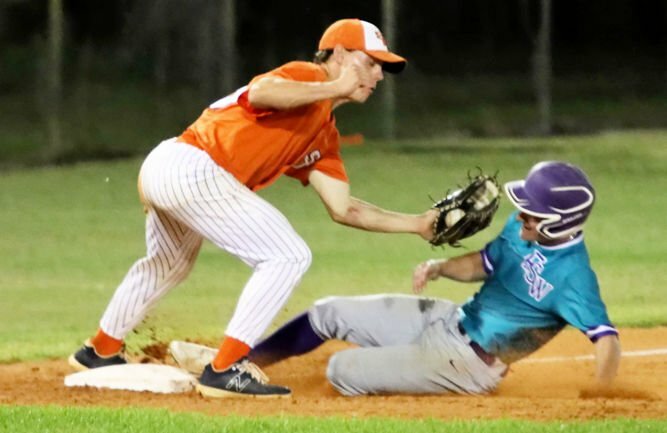 A Florida Southwestern runner slides safely into third before South Florida’s Case Hannum is able to make the tag during Monday night’s game at Panther Field. South Florida’s P.J. Cimo hits a solo home run in the seventh inning to give the Panthers a 7-3 lead. 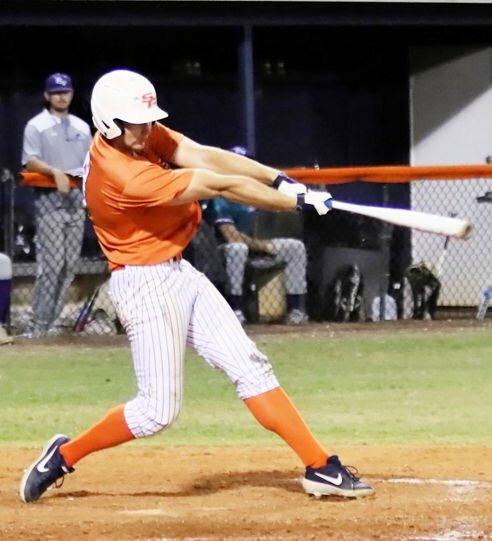 AVON PARK – The South Florida State College Panther baseball team squandered a chance to beat the top-ranked team in their conference Monday night, falling to the Florida Southwestern Buccaneers by a score of 9-7 in a Suncoast Conference game. The Panthers, after falling behind 1-0, built a 7-3 lead after seven innings, only to hit the proverbial wall in the eighth inning, giving up six runs to fall behind 9-7. South Florida State College dropped to 10-17 on the season and 1-4 in the conference, while Florida Southwestern State College improved to 23-3 and 5-0 in conference play. The Panthers showed they have the ability and capability of playing against the Buccaneers, losing by two runs in a pair of games. Falling behind 1-0 after the second inning, the Panthers tied the game in the bottom of the third on a Mike Bessell solo home run over the right-centerfield fence. The Panthers answered the call again in the bottom of the fourth after the Buccaneers reclaimed the lead, 2-1, with three runs of their own. Casey Asman led off with a single and reached third on an error, Case Hannum walked. The two pulled off a double steal that allowed Asman to score to tie the game at 2. Base hits by Leeandro Alfonzo and Bessell led to two more runs as the Panthers held their first lead of the game at 4-2 after four innings. The Buccaneers scored a run in the top of the fifth on three walks and a wild pitch to cut the Panthers lead back to one at 4-3. In the bottom of the fifth, South Florida State College scored two more runs on singles by Zeddric Burnham, Asman and Hannum as the Panthers built their biggest lead to this point at three runs, 6-3. A solo home run by P.J. Cimo in the bottom of the seventh gave the Panthers a 7-3 and a solid chance of giving the Buccaneers their first conference loss. That fell apart in the top of the eighth as the Panther pitchers began to struggle with the strike zone. After three walks, a hit batter, a single and a bases-clearing double by the Buccaneers, the Panthers found themselves trailing 8-7. An error allowed one more run to score as the Buccaneers took a 9-7 lead, which they held on to, shutting down the Panthers the final two innings. Asman and Bessell each had three hits for the Panthers in the loss. The Panthers will have another shot at the Buccaneers, playing in Fort Myers tonight, before starting a three-game series against the State College of Florida at Panther Field on Friday.